How does a major tech brand make its logo stand out on a football shirt? We're not designers by trade, but we reckon putting it on the front of the kit where you can see it might be a good start. 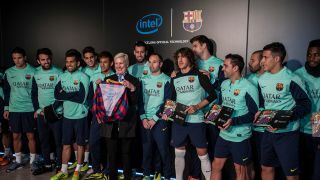 FC Barcelona has decided against such folly, instead placing Intel's logo inside the team's jersey after signing a sponsorship deal with the chipmaker. It's possibly Barcelona's most pointless deal to date, which is impressive for a club that once signed Alexander Hleb for €15 million. The European footballing giant will be supplied with 2-in-1 convertibles as part of the sponsorship, and Intel will be working with the club to "improve the fan experience through new technology" at its Camp Nou stadium, according to a statement. Whether that will improve Messi, Xavi and Inesta's already stellar technical skills remains to be seen.